Cube bread rolls and add to a bowl. Add lukewarm milk and knead by hand. Let soak until the rolls are soft. Peel and finely dice onion and mince parsley. Cut liver into smaller pieces and transfer to a food processor. Add diced bacon and mix until smooth. Add liver-bacon mixture, diced onion, minced parsley, dried marjoram, breadcrumbs, eggs, and soaked bread rolls to a bowl and mix until smooth. Season with salt and pepper. In a large pot, bring beef stock to a boil. Form quenelles from dumpling mixture and add to beef stock. Reduce heat, as the dumpling should not be boiled. Let simmer for approx. 25 min. 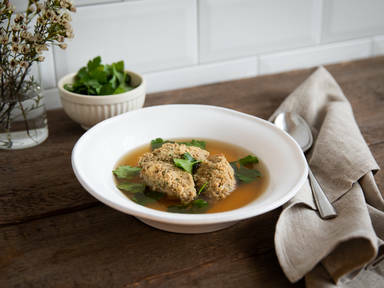 Serve liver dumplings in the beef stock and garnish with fresh parsley. Enjoy!